Editor’s Note: This summary and report was co-authored by Lead Audience & Revenue Strategist Ben Ilfeld and President & Founder Jake Goldman. On September 16, Apple launched iOS 9 with a suite of enhancements. One buried feature has the web content industry talking: content blocking. The immediate and obvious use case being blocking of ads and third-party scripts often used for site metrics. Less than one week in, a $0.99 ad blocker is atop the iOS App Store’s paid app charts, and a $3.99 ad blocker trails right behind it. Much has been said about the ethical implications and hypothetical impact. Clients who look to 10up for web and online revenue strategies were, naturally, less interested in debating whether content blocking is fair, and more interested in modeling their potential impact and adapting. While we couldn’t help touching on the ethics – an open web is core to 10up’s DNA – we focused on analyzing technical realities, data informed predictions, practical industry implications, and potential strategies publishers can apply to face a changing landscape. Read on to review highlights from the report, or skip ahead and download our free eBook in PDF or ePub format. iOS has a bigger impact on mobile web ads than you might think. Many publishers supported by 10up see roughly 30% of ad exchange revenue from the mobile web. Outliers are as high as 60% and as low as 5%. Publishers often see eCPM (prices) 30-55% lower on mobile than for the same content on desktop. If publishers traded “print dollars for digital dimes” (still relatively true), they’re now seeing mobile nickles. iOS accounts for a disproportionately large share of United States mobile operating system web traffic: 61.4% compared to Android’s 37.5%. Anecdotally, many publishers supported by 10up have outsized iOS audiences. Several see 40% of their total traffic drawn from iOS devices; one sees 50% coming from iOS. iOS’s outsized share of web traffic is magnified by data suggesting higher disposable income, or at least a greater propensity to spend money on the mobile web. One report suggesting 78% of 2014 Christmas sales on mobile devices were conducted on iOS is stunning. This skews mobile web ad targeting and valuation more heavily toward iOS devices. A typical mid-sized publisher might see a hit between 4 and 11% of web ad revenue, depending on adoption models. We invented a hypothetical mid-size publisher based in the United States and reliant on exchange banner ads, using private data from a variety of sources and industry data reviewed in the report, including adoption models that predict equal or greater adoption compared to desktop ad blockers. Eight months from now, our hypothetical publisher could see a 3.7% drop in ad revenue. With astronomical content blocker adoption (3x desktop rates) driven by App Store visibility and media coverage, that number could be as high as 11%. A potentially severe setback for businesses with thin margins. The long-term impact may be more dramatic without a change in strategy, since mobile web banners have been a growth area, even with today’s low prices compared to desktop. A trend toward native advertising will accelerate. Ad blocking is rarely effective when the fingerprints of an ad are unique to individual sites. As advertisers buy into native ads, they will expect better analytics and distribution, both of which could be harmed by content blocking. Enabling technologies will have to evolve.The Software as a Service (SaaS) model that favors remote hosting could tilt in favor of self hosted and open source solutions, or at least, evolve to feign more native integrations. Expect growth in native content management system integrations (vs. drop in scripts). Pre-roll video and in-content audio ads will continue their ascendance. These are more difficult to block, and publishers are already looking to video for higher prices. Producing sponsored video content can be challenging for smaller operations, and achieving actual engagement within a predominantly and traditionally text-heavy site can be more difficult than it may initially appear. Alternative direct revenue strategies such as paywalls, crowdfunding, and membership programs will grow. Direct strategies are more diverse, and no longer the sole province of embattled print operations. Publishers of all stripes can leverage alternatives like crowdfunding and “supplemental content” gateways to establish stronger relationships with their most voracious readers and fans. Direct e-commerce and affiliate programs will gain ground. Publishers, especially in niche verticals like travel, fashion and technology will sell products to readers through their website. We see growth in first party options that integrate with content management systems (like Automattic’s WooCommerce), as well as branded e-commerce storefronts managed by third parties that share revenue. Affiliate link adoption will similarly increase. Influencer marketing will grow. Endorsements from media companies and celebrity journalists on social networks like Twitter will increase. Marketers are already armed with tools to build pinpointed social campaigns leveraging individual influencers. Tools like Tellagence map out current reach and explicitly identify social media users who can dramatically improve a campaign. What might the shift look like? Take this 10up client for whom we offer revenue strategy consulting. They have a large iOS audience, and sell a significant amount of ad inventory direct. Overall revenue has steadily increased during this four-year period, such that a decrease in the makeup does not represent a loss in any single category. Over 4 years they moved from ads accounting for ~75% of revenue to ~40%. 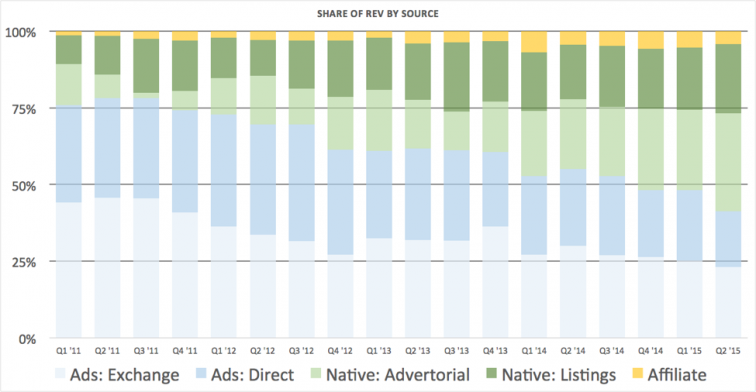 Native listings and advertorial grew significantly, now accounting for more than half of their revenue. For this client, iOS 9 ad blocking will cut revenue by less than 2%, if nothing else changes. To the extent it results in an improved user experience, an increase in traffic might actually drive increased revenue in other revenue channels, offsetting the loss. No paywalls, no gateways: download our full, in-depth report, analysis, and recommendations for free in ePub or PDF format from Google Drive. This is a really comprehensive look at the implications for ad-blockers for publishers of all types. Especially helpful was the look at the current industry shifts and where the market will accelerate thanks to other revenue options. One area this report doesn’t touch on that would be interesting to explore is whether the uptake on desktop ad blocking software will go up as folks start hearing / experiencing it on their mobile devices. It could be a vicious cycle where ad blocking is the new norm. In theory I have no problem with this model – “If you block our ads we won’t let you see the page” – but they do need to be very careful about false positives. As ad blockers become more common, I expect that this “feature” will become more and more common on web sites. It’ll become very similar to the ongoing war between virus writers and anti-virus writers. Ad blockers will try to trick sites into thinking ads aren’t being blocked. Web authors will come up with more clever ways of detecting ad blocking. Round and round she goes….